The purpose of this page is to provide Oregon State’s teaching and research faculty with information about faculty unions generally and about the context of United Academics Oregon State University’s (UAOSU) unionizing effort. Faculty unions are made up of teaching and research faculty members who share common interests and join together to further their collective goals. Through their unions, faculty gain greater voice for their concerns. A faculty union has the right to collectively bargain a legally binding contract with their employer, and then ensure that the contract is continually enforced. Higher education has undergone significant changes over the past several decades, compelling faculty nationwide to unionize. University administrative positions grew at 10 times the rate of tenured faculty positions between 1993 and 2009. Where tenure track positions were once the norm, contingent faculty (non-tenure track) now make up 70% of university faculty, and 50% of these faculty are part-time. Tuition costs have rapidly increased, with Department of Education data showing a 33% increase between 2004 and 2015. 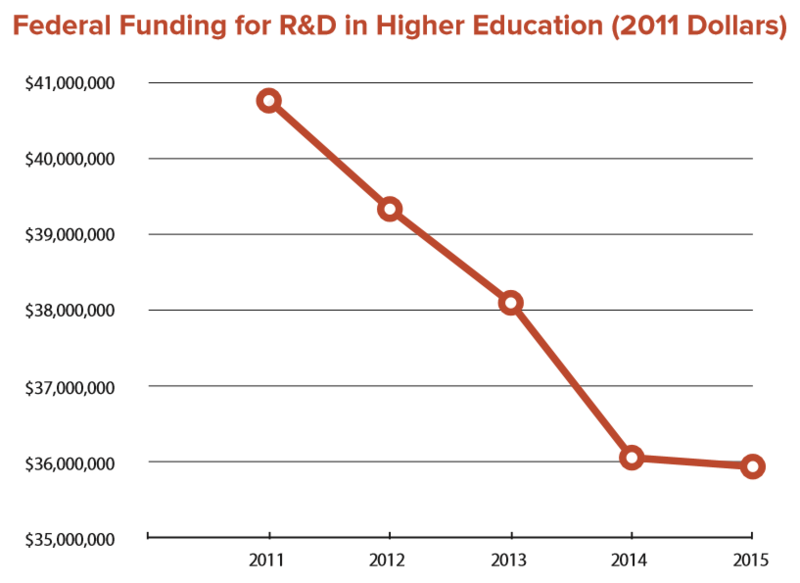 According to the National Science Foundation, federal funding for research and development in higher education has declined nearly 13% since 2011, when adjusted for inflation. Facing these trends, faculty across the U.S. have decided to organize – a topic that will be covered at length in the following section. Although laws in several states prevent university faculty from unionizing, faculty across 31 states in more than 500 colleges and universities have established unions. Notably, two of the largest higher education unions – American Federation of Teachers (AFT) and American Association of University Professors (AAUP) – have partnered together to support organizing and secure collective bargaining rights at research universities, such as Rutgers University, the University of Alaska, and the University of Vermont. Oregon ranks among the lowest states in terms of higher education funding. State spending per student on higher education declined 51% in Oregon between 2000 and 2014 – the most drastic reduction in spending in any state except for Michigan. 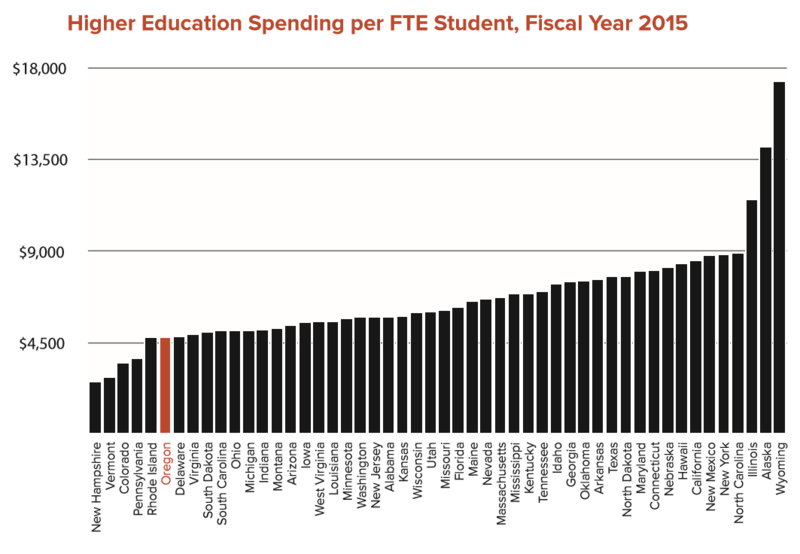 In fiscal year 2015, our state was ranked 45th in higher education spending per FTE student. Here at OSU, concern is growing that currently only 32% of undergraduate students graduate in 4 years. Since 2007, enrollment has increased by 51% and in-state undergraduate tuition by 84%. Class sizes have increased every year – a trend that has produced a 32% growth in class sections with 100+ students. Expenditures on administration have nearly doubled in that time, far outpacing growth in spending on instruction and research. Meanwhile, as a share of total university spending, expenditures on research have decreased 7%. Faculty unions are increasingly commonplace in higher education. In the last five years alone, faculty have unionized at the University of Oregon, University of Illinois at Chicago, Michigan State University, Northern Illinois University, and Temple University, among many others. Even so, many higher education institutions face significant barriers to organization. It is extremely difficult for faculty to form unions at private universities and colleges. Additionally, more than 20 states have laws that either discourage or prohibit public employees from unionizing. Other states have specific laws that make organizing faculty in particular more difficult. But where the law supports it, as in Oregon, faculty routinely organize. The list below includes universities comparable to OSU in the Carnegie classification of “Very Highest Research.” A majority of universities with this designation in states with supportive laws have faculty unions. Many land grant universities have faculty unions as well. While the most relevant universities for faculty at OSU can be found below, here are some additional examples. Grievance and Arbitration Procedures: Nearly all faculty union contracts contain guarantees of representation and due process for handling work complaints and grievances. In cases where a resolution cannot be reached between the faculty member and administration, most contracts detail neutral third-party arbitration procedures, the results of which are binding. Shared Governance: Traditionally, shared governance ensures meaningful faculty participation in the administration of the university. United Academics of the University of Oregon’s contract requires that a number of department/unit level policies be made in consultation with faculty, including career track non-tenured faculty. Their contract further stipulates that all “duly adopted” policies – such as those approved by the Faculty Senate, as well as department/unit level policies – can be enforced through their union’s grievance process. This includes policies about workload, promotion, tenure, and merit raise procedures. All levels of administration are held accountable to university policies adopted through shared governance practices. Similar guarantees exist in contracts at the University of Florida and Wayne State University. Employment Stability and Security: Faculty unions have also successfully negotiated around issues such as salary compression, workload, and multi-year contracts. Faculty unions at the University of Michigan, University of California, Wayne State University, and the University of Oregon all guarantee access to multi-year contracts for their non-tenured faculty. In the California State system, instructional faculty employed for six years are eligible for 3-year contracts with the presumption of renewal, based on satisfactory performance. Research Funding and Support: Unions have successfully negotiated beneficial policies for soft money researchers. The faculty contract at Bowling Green State University incentivizes grant funded research by guaranteeing bonuses for PIs who obtain new external grants over $50,000. Additionally, 5% of the indirect costs is returned to PIs’ professional development accounts. The CUNY contract establishes a set of faculty reviewed internal research awards in excess of $3,000,000 – guaranteed to grow annually by $180,000. Wayne State University and the SUNY system have created funds and similar review committees for supporting faculty research. Bridge Funding: This funding secures a continuous salary and maintains benefits for research faculty between grants. United Academics at the University of Vermont ensures their researchers have access to nine months of financial support when external funds are terminated. University of Connecticut similarly supplies a secure source of bridge funding. Lab/Workplace Health and Safety: Universities are legally required to provide the information, training, tools, clothing, and equipment needed to safely carry out all university business in labs and workplaces. The Research Support Faculty Union at UC Davis contract contains an exhaustive lab safety and protocol mandate to ensure compliance. Intellectual Property: United Academics of the University of Alaska contract language thoroughly defines intellectual property, work, and inventions; and specifically mandates the division of all rights and proceeds. The California Faculty Association negotiated to retain the rights to materials faculty created so long as there is no extraordinary University support. This protects faculty teaching traditional classes, online classes, and in extension for credit. Professional Development: Unions have bargained to improve professional development access for all faculty ranks. Through collective bargaining, the faculty at Cornell University, University of Michigan, Wayne State University – among other places – prioritized professional development for part-time and adjunct faculty. The UC Davis Research faculty contract provides up to 40 hours of paid release time per calendar year for job-related training. The UC Davis post-doctoral contract guarantees leave time and funding for professional development. Contracts at the University of Oregon and Portland State University increased the rates of sabbatical pay and extended the right of sabbatical to non-tenured faculty. Family Friendly Policies: Many faculty unions have negotiated paid family leave as well as paid sick leave. Florida State University’s contract allows faculty to take up to 6 months of paid parental leave for the birth or adoption of a child. The Rutgers University faculty contract guarantees paid family leave for parents – regardless of gender – for newborn or adopted children and up to six weeks of paid leave for birth mothers. At UC Davis, faculty bargained for paid sick leave and up to 30 days of paid leave to be used to care for other family members. Salary and Raises: Most union contracts utilize three types of raises – raises to minimum salaries, “across the board” raises, and merit raises. Salary requirements are typically focused on salary minimums, not maximums. Some contracts, such as at Rutgers University, explicitly guarantee the university’s ability to raise individual salaries in response to market conditions. Salary compression and equity are also often addressed in faculty contracts. The California State system sets aside specific funds for equity and compression adjustments to be made in addition to base salary raises. Exceptional Service: The faculty in the California State University system bargained for time and compensation for exceptional levels of service to students. The California State University System is required to provide $1.3 million per year for adjustments in workload or incentive compensation for those faculty who provide exceptional service to students. Though we haven’t officially certified our union yet, we are already working with other coalition groups to strengthen the higher education labor movement in Oregon. In the spring of 2017, UAOSU activists collaborated with AFT-Oregon, AAUP-Oregon, faculty at other institutions, environmental groups, student groups, and lawmakers in Salem to successfully pass House Bill 3170 (HB3170). With the passage of HB3170, the Public Employee Collective Bargaining Act (PECBA) no longer excludes faculty in supervisory positions from collective bargaining. In addition to expanding collective bargaining rights on a state level, support for our union is growing every day here at OSU. We are regularly speaking with our colleagues about their experiences at OSU, their aspirations for a better OSU, and the prospect of our union as a conduit to achieving that goal. 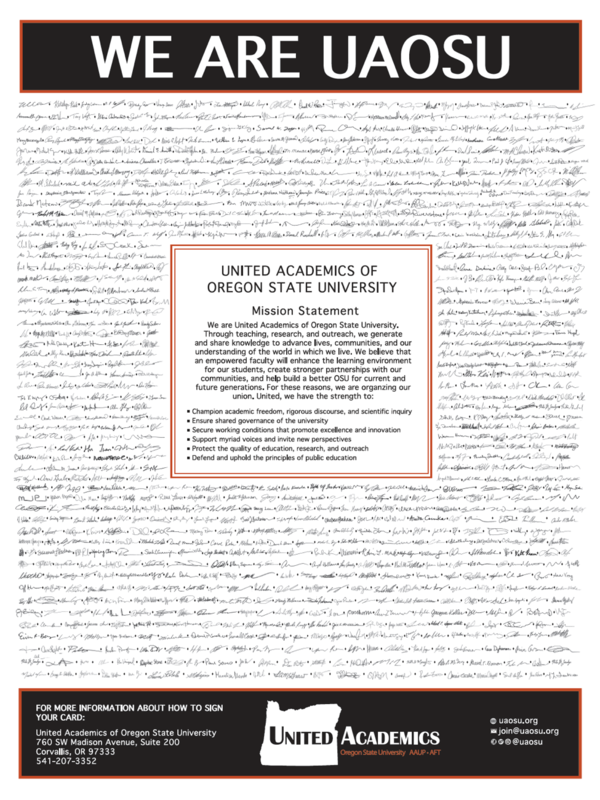 Over two hundred of us submitted statements of support for UAOSU, and more than a thousand have signed our mission statement – indicating substantial support for formally recognizing our union. Next, we will seek formal certification of our union through the legal process of “card check,” explained in the next section. How Do We Organize a Faculty Union in the State of Oregon? Before we can bargain with the university administration, our union must first be certified by the Oregon Employment Relations Board (ERB), the state agency that administers the Public Employee Collective Bargaining Act (PECBA). PECBA allows us to participate in a process called “card check” to certify our union. Card check is an inherently more democratic process than a conventional election. Card check requires at least 50% + 1 of all employees sign an authorization card in order to indicate their wish to be represented by a union. In contrast, with a conventional election, only 50% + 1 of the employees who choose to vote would decide on behalf of all faculty whether or not they form a union. In a conventional election, a minority could decide for the majority; with card check, that could never happen. Here at OSU, once a majority of faculty have signed authorization cards, we will present them as evidence in a petition to the ERB for review. At this point university administration has three legal choices: choose to simply recognize our union, let the ERB process move forward, or challenge our petition for certification. Any challenges or questions are resolved by the ERB, either by working with the parties or through a hearing process. Once the ERB determines that the petition is appropriate and a majority have indeed signed union authorization cards, our local is certified. At that point, we would initiate bargaining with our employer and enjoy the full protections that exist under Oregon labor law. For a card check process to be successful, it is essential that we build the structure and organizational capacity required to sustain our union well beyond certification. Over the past couple of years, we have created committees and workgroups to accomplish the work of organizing our union. We continuously seek to broaden and deepen support and develop new leaders before, during, and after the certification process. Upon certification, we will simultaneously build membership, solidify our internal structure, decide on our constitution and bylaws, and start the collective bargaining process. A membership survey will establish bargaining priorities, members of the faculty will form bargaining and research committees, and our bargaining team will engage in collective bargaining negotiations with the university administration. Once this part of the process is complete, the faculty bargaining team submits the tentative contract to the membership for a ratification vote, which gives the entire membership the opportunity to accept or reject the terms of contract. After a contract is ratified, members, elected leadership, and/or staff work together to continually ensure that the contract is upheld by the university administration and secure due process for any contract violations by the administration. Further, we will maintain a democratic organization by facilitating regular meetings and engaging members on an ongoing basis. Our organizing effort is being supported by a partnership between the American Association of University Professors (AAUP) and the American Federation of Teachers (AFT). As two of the largest labor organizations in higher education, they represent nearly 300,000 faculty and staff across the U.S. This is the same partnership that helped faculty at the University of Oregon build their union and win certification in 2012. Together they are providing this campaign with crucial resources and experience. Founded in 1915, the AAUP’s purpose is to advance academic freedom and shared governance, to define fundamental professional values and standards for higher education, and to ensure higher education’s contributions to the common good. The AAUP is made up of more than 50,000 members nationally, with numerous professional associations called advocacy chapters, as well as a Collective Bargaining Congress. At the state level, AAUP-Oregon members from both the Collective Bargaining Congress and advocacy chapters engage in political advocacy for higher education through their state legislative committee and lobbying efforts. Established in 1916, the AFT is a union of professionals that champions fairness; democracy; economic opportunity; and high-quality public education, healthcare, and public services for students, their families, and our communities. AFT has over 1.5 million members, representing some 230,000 higher education employees in 320 locals. These members include full-and part-time faculty, professional staff, and graduate employees, working in all sectors of public and private higher education. AFT-Oregon is a federation of locals – the majority of which are in higher education – that coordinates with and provides resources and staff support, conducts political outreach, and provides legislative support for members. AFT affiliates are also members of a national coalition of labor organizations, the American Federation of Labor and Congress of Industrial Organizations (AFL-CIO). Founded in 1955, the AFL-CIO is a voluntary federation of 55 national and international labor unions that represent 12.5 million workers. The AFL-CIO strives to ensure that all workers are treated fairly and have access to decent wages, benefits, a safe workplace, and equal opportunities. Furthermore, the AFL-CIO works closely with state and national legislatures to create living wage jobs in the US while investing in schools and infrastructure. Members of our local will make decisions about dues, including the specific rate and how dues will be assessed. Union dues cover the basic costs of union representation in order to keep the organization strong and effective. Contract bargaining, contract enforcement, membership meetings, outreach, internal organizing efforts, office space – all of these require financial resources. Dues also cover affiliation fees. These fees cover the costs of various activities, including political action, research, new faculty organizing campaigns, and continued support to locals. For United Academics of Oregon State University (UAOSU) in particular, affiliation fees would be paid to the AFT and AAUP national and state federations, as well as the Oregon AFL-CIO. It is typical for faculty unions to assess dues as a percentage of salary, though some unions choose to implement a flat fee. Most AAUP and AFT faculty unions have rates in the range of 1%-2% of a faculty member’s total salary. No one pays dues until members have successfully bargained and ratified a first contract. Dues are most often collected by a simple payroll deduction process. However, those in the bargaining unit who choose not to join their union – and thus forgo their rights to vote on collective bargaining agreements, by-laws, union leadership, etc. – are in a slightly different situation. Most unions bargain for a “fair-share” provision that allows them to collect the costs of bargaining and contract implementation from everyone covered by the contract, which includes these non-members. In such circumstances, the law requires that these fair-share dues cannot be used to support political action or members-only benefits, and therefore may be less than full union dues. Find your place in United Academics. Together, we will build our union and a better OSU. Copyright © 2017 United Academics of Oregon State University All Rights Reserved.